H.S. Goodhart-Rendel designed this Catholic church, which was built in 1957-60 near Bermondsey's waterfront just downstream of Tower Bridge. It occupies a prominent corner site. The previous church of 1834-5 stood in nearby Parker's Row in a much less conspicuous position; it was destroyed by bombing in 1940. Most Holy Trinity's west front boasts two towers and a vast window above the main door. 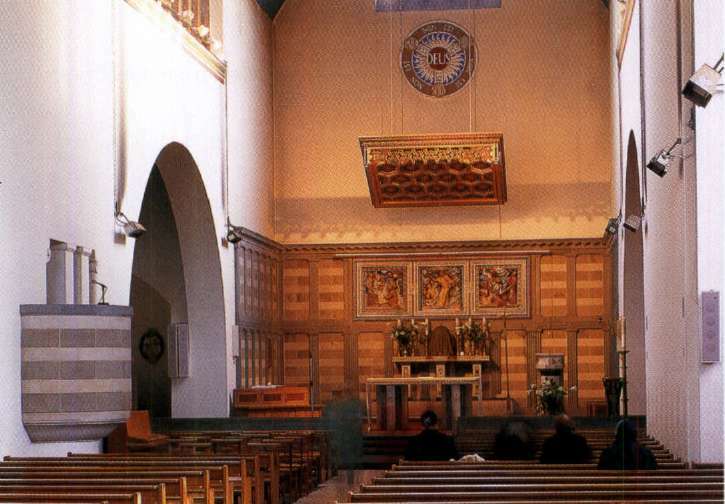 The interest of the present church is its unusual style, which is markedly different from most contemporary designs, and all the better for that. The focus of interest is undoubtedly the west front of two towers and a huge west window above the main door. The design looks Norman in style and scale, although the details are purely Goodhart-Rendel's. The rest of the church is less striking, but the design throughout is influenced by Norman work. There are patterned brick walls, concrete vaults and a timber roof with slates from Bangor called Welsh greys. The doors have surrounds of green slate from Westmorland. Within, there is the same attention to materials of good quality and decorative inventiveness. The stone panelling in the sanctuary consists of Portland, brown York and blue-grey Forest of Dean stones. Atri Brown was the sculptor. The steps have Belgian marble risers. An African timber called Muninga was used for the floor. A memento of a long-vanished local glory is the mediaeval capital from Bermondsey Abbey, which was found in 1955. 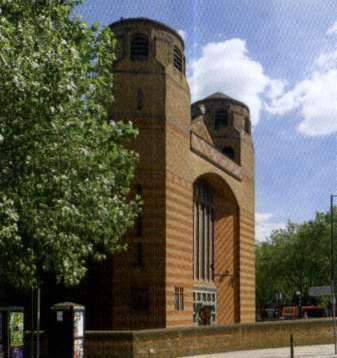 H. S. Goodhart-Rendel paid close attention to the use of high quality materials and decorative inventiveness in this post-war church.